After a very successful private Everest Marathon expedition in 2017, we’re pleased to offer full services for next year’s race. On our bespoke private tour, you’ll be accompanied by a Nepalese climbing Sherpa throughout your adventure. Your Sherpa will also run with you on race day, to shadow you on the course. Throughout the trip you’ll stay in the best lodges available, and will have a private Base Camp with your own chef. You’ll also make use of our modern Airbus helicopters to access the region safely and efficiently. This is a full service expedition with everything taken care of. In Kathmandu we use a small selection of hotels of a very high standard. On the trek, we use the best available mountain lodges. These all have private rooms, and all but the highest also have ensuite with toilets and sometimes showers too. At Base Camp, instead of staying in the marathon area, you’ll have a private section with chef and full services including internet, a heated dining tent, high quality sleeping tent and private toilet and shower. You’ll fly in to Lukla by private B3 helicopter, which makes landing at the infamous Lukla airstrip much safer. The same helicopter can be used to extract you from Namche Bazaar after the race, getting you back to Kathmandu quickly for celebratory drinks. Upon arrival at Kathmandu Tribhuvan Airport, you’ll be met by your driver and taken to the famous Yak and Yeti Hotel. One of the best hotels in Nepal, it is truly an urban oasis. Evening kit check and briefing. We continue trekking along the banks of the Dudh Kosi, passing a checkpoint before crossing this roaring river on exciting suspension bridges laden with prayer flags. After entering Sagamartha National Park, the trail climbs steeply, offering us our first breathtaking views on foot of Everest and Lhotse as we reach Namche Bazaar, the gateway to the Khumbu region. B/L/D. A leisurely start to the day before you take an acclimatisation walk to Bibre. This valley forms an important part of the marathon course, as you double back on yourself for what’s known as “Bibre Loop”. Afternoon resting/ enjoying the delights of the excellent bakery. Summit day! A very early start as we make our bid for one of the most beautiful trekking peaks in the Everest region. We’ll skirt along a glacier, before climbing steeply on snow up to a spectacular summit ridge. There are fixed lines protecting the more difficult sections. 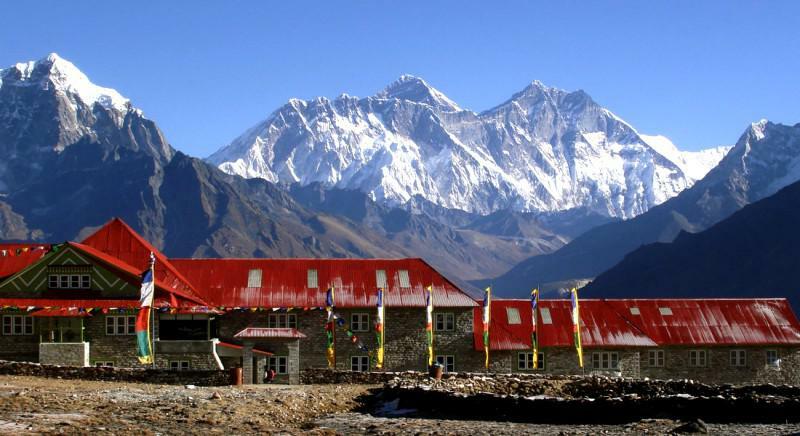 After a brief celebration on top, we’ll descend all the way to Lobuche village for a good nights sleep. B/L/D. 26th May - Day 12: Trek to Gorak Shep, 5100m. 27th May - Day 13: Trek to Everest Base Camp, 5,360m. 28th May - Day 14: Trek to Everest Base Camp, 5,360m. Full day at Everest BC. Rest/ acclimatise/ race briefings. Overnight Base Camp. B/L/D. 29th May - Day 15: Everest Marathon. 30th May - Day 16: Fly Namche to Kathmandu. This morning the helicopter will return to pick you up and fly you down to Kathmandu for a very well earned long hot shower. Evening celebrations. Overnight Kathmandu or flights home. The Everest Marathon takes place on the 29th May each year, the anniversary of the first ascent of Mount Everest. In order to have sufficient time to acclimatise, we recommend starting the trek in mid May. The trek itself is suitable for fit walkers. A typical day involves 4-6hrs of trekking over undulating, often rocky terrain and dirt trails. The optional ascent of Lobuche East involves climbing fixed ropes on steep snow at over 6,000m, and is suitable for those with prior mountaineering experience. The marathon itself is a very arduous day, but the cut-off times are generous so it should be achievable for fit and well acclimatised participants.